Maruti Suzuki has informed dealerships to stop taking orders for the Ertiga in the Ldi grade. The company will stop selling the MPV’s diesel engine model in the entry-level grade on 1 April 2019. IAB learns that official communication came in early March. 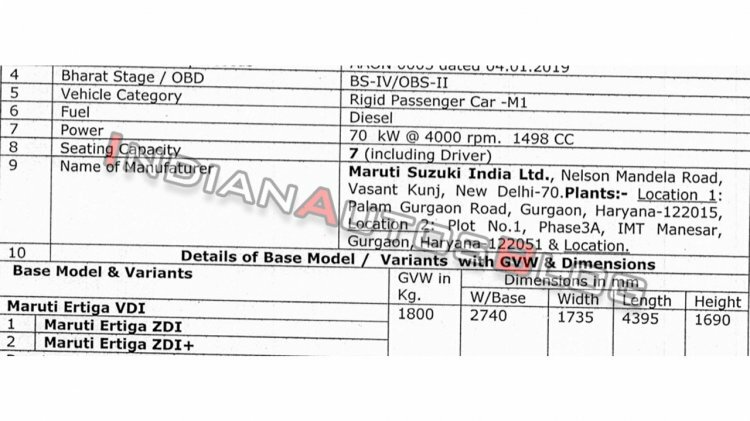 Maruti Suzuki will offer the Ertiga 1.5L diesel in Vdi, Zdi and Zdi+ grades. Maruti Suzuki is on the verge of introducing the E15A 1.5-litre diesel engine in the Ertiga. Reports say that instead of offering it in addition to the existing D13A 1.3-litre diesel engine, the company will offer it as a replacement for the same. IAB had revealed in February that customers going for the new engine will have to select from Vdi, Zdi and Zdi+ grades. The Ldi grade comes equipped with features like halogen projector headlamps, LED tail lights, dual-tone interior, 60:40 split second-row seats, 50:50 split third-row seats, monochrome MID, front and rear power windows with driver side auto down function, tilt steering, speed sensitive auto door lock, dual airbags and ISOFIX child seat anchorages. The D13A 1.3-litre diesel engine produces 66 kW (89.74 PS) at 4,000 rpm and 200 Nm of torque at 1,750 rpm. It comes with the old single-battery mild-hybrid system. A 5-speed manual transmission channels power to the wheels. The E15A 1.5-litre diesel engine, also a four-cylinder unit with a variable geometry turbocharger, develops 70 kW (95.17 PS) at 4,000 rpm and 225 Nm of torque at 1,500-2,500 rpm. It is also a BS-IV compliant unit, but a BS-VI upgrade is planned. There’s no electrified technology assisting the new engine, which is paired with a 6-speed manual transmission. The soon-to-be-discontinued Maruti Ertiga Ldi retails at INR 8,84,000 (ex-showroom Delhi).